This isn't a daily painting but a larger work I did some time ago. This is Pablo (as in Picasso), our beloved little dog who died of old age last weekend. Such a loving friend and companion to us empty-nesters, he leaves a real void. 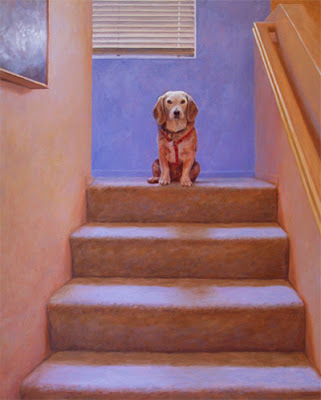 Here he is at the top of the stairs, waiting for me to get the leash and take him for a walk. The painting is currently in a show in New York, but when I get it back I think I'll keep it. I just wanted everyone to see what Pablo looked like. I feel your loss. Keep the happy memories of Pablo in your heart. Don, We saw this painting when you exhibited it in the Condon show this summer. Thought it was wonderful. It really reveals your love of Pablo. Boyd and Sandra always put together a great show in Condon, don't they? Thanks for your kind words. Hey Don: Sorry to hear that Pablo's gone. Ever since I've known you, Pablo has been part of you, and I'm sure he always will be. Such the mellow companion and adventurer, always sharing excuberance and comfort. Your paintings of him do him justice, indeed! Mark, I sure thank you for your caring comments. Amazing how these little animals work their way into our lives and hearts, isn't it? Long live Keta and Scully! Don I am so saddened to read your post. This painting is a beautiful loving piece as is my little 'Pablo's Pad' that I was fortunate enough to buy from you. I knew it was special the first time I saw it, but I appreciate its poignancy even more now. Perhaps it will warm your heart to know the extent to which Pablo was able to touch others; my children love the little painting of him on our wall. Triecia, I sure appreciate your comforting words--thank you. I'm so sorry to hear about Pablo's passing. Thanks for your concern, Joan.